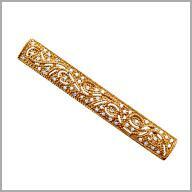 14K Diamond Swirl Hair Barrette,0.1950 ct diamonds. Top of your wedding day style with this beautiful barrette! Crafted in polished 14K gold, this hair barrette features 39 round cut diamonds in pave settings making small swirl designs. The total diamond weight is approximately 0.195ct with a color of H and clarity of SI. It measures 2 –1/4" x 5/16". Why not give your hair a little sparkle? Mine is the white gold with hearts and its beautiful enough wear on special occasions or everyday. Its small but big enough to pull my blonde bangs back in the front with adding a bit of sparkle and it compliments my diamond earrings without being over the top. Its also weighty and stays in place nicely. 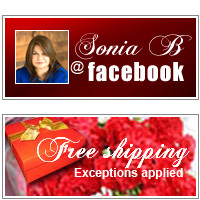 As always, Sonia knows how to make a great piece of jewelry. I would recommend it.